Today, we’re proud to announce the general availability of our SAP S/4HANA Cloud 1902 release. Our 1811 release, as well as the rest of the last year was fully dedicated to delivering the intelligent enterprise suite. This year, we will continue this journey moving full speed ahead. This blog is intended to give you a first snapshot of our brand-new 1902 innovations within SAP S/4HANA Cloud, SAP’s intelligent, next-generation cloud ERP solution. For a quick overview of all the great new innovations, play my video below. Thanks to this key highlight in Finance, you can significantly speed up your closing processes by planning, executing, monitoring, and analyzing financial closing tasks for the entities of your group. Advanced Financial Closing provides full transparency regarding the complete closing process and allows for multiple persons involved in the same activity. On top of that, it supports you with periodically recurring closing activities with a fixed chronological or dependent sequence. 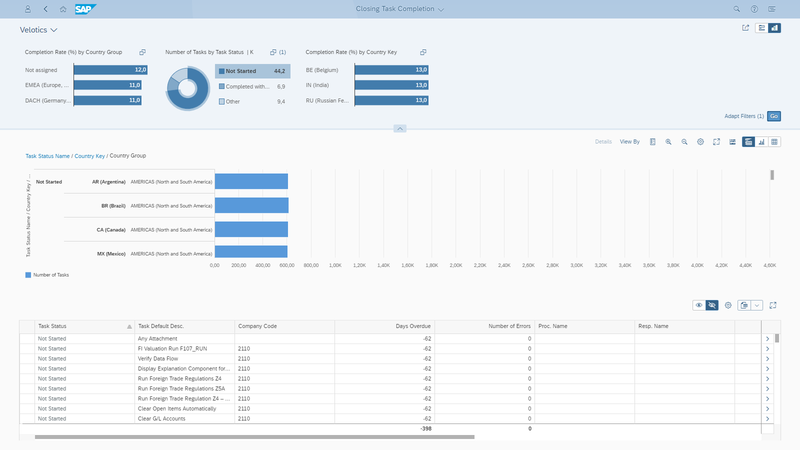 The new matrix consolidation functionality in SAP S/4HANA Cloud comprises consolidation for management-oriented organizational units such as profit centers and business segments. It enables business unit managers and group controllers to rapidly respond to changes resulting from internal restructuring. In addition, the group structure manager allows you to main consolidation group specific settings for consolidation unit and consolidation unit assignment. With our brand new ‘Inventory KPI Analysis’ app, you can effectively ensure forecast and inventory accuracy for your inventory. With its attractive user interface, the app allows you to effectively monitor the inventory flow according to critical key performance indicators (KPIs) such as stock changes, consumption changes, inventory/aging changes, inventory/turnover changes, and range of coverage changes. On top of that, inventory analysts can investigate potential issues and, for example, identify potential outliers affecting the fixed capital situation. With our new quality management functionality, you can now perform quality inspections during goods receipt. This allows you to inspect products which have been delivered by production or external suppliers before putaway in the warehouse. You can also record usage decisions for partial lots if only part of the stock items in the inspection show the desired quality. 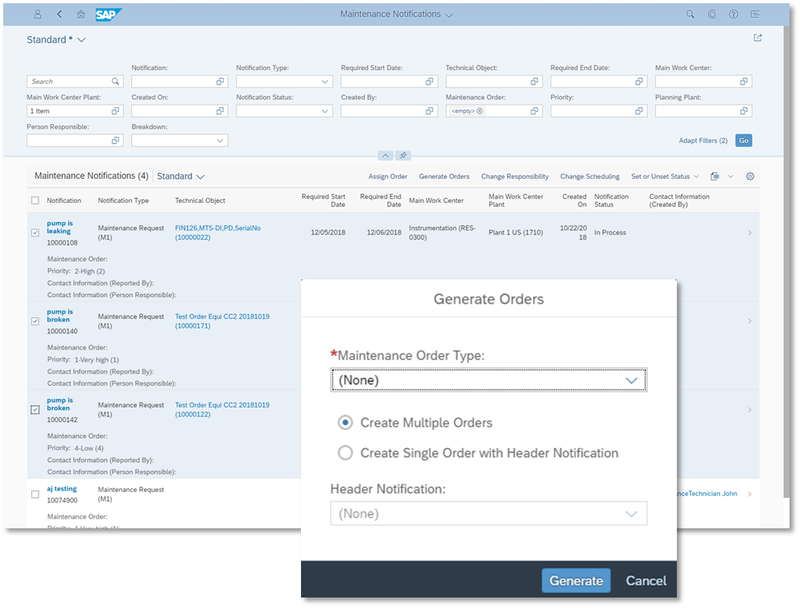 Our SAP Fiori app ‘Maintenance Notifications’ allows you to perform mass generation of orders for maintenance notifications. You can either generate separate maintenance orders for every maintenance notification that you have selected or you can generate one single maintenance order for all selected maintenance notifications. 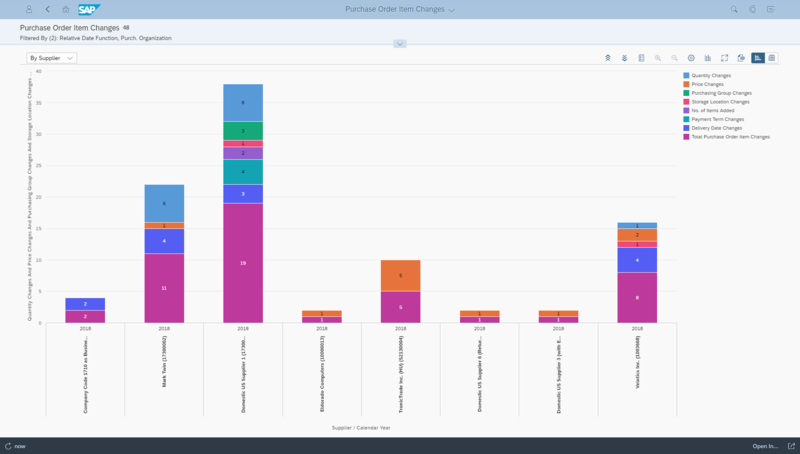 In the SAP Fiori app ‘Purchase Order Changes’, you can now monitor changes to purchase order items, such as purchasing group, supplier, quantity, material group, and price in real-time. You can drill down to purchase order item level to take necessary actions. Our new functionality for service contract management enables you to handle service contracts coming from external systems. Service contracts are outline agreements with business partners that define services offered for a particular period and usually represent a long-term service agreement with customers. In addition, SAP S/4HANA Cloud 1902 provides a holistic view of all services that a customer has subscribed to. This way, you can manage pricing agreements and discounts to have the flexibility to offer services priced based on your customers’ needs. As of SAP S/4HANA 1902, you can now maintain country, state, and local work locations of employees or service performers in the timesheet. This allows you to handle or track location-specific processes, such as tracking project tasks executed at a customer site. With situation handling, you can now mitigate several potential business risks in Procurement. The system proactively alerts you regarding non-deliverable items based on supplier confirmation, missing confirmations for demands that are due soon, overdue purchase orders in connected systems, as well as contracts which will expire soon or are almost consumed. Thanks to this, you can take the necessary steps at an early stage and thus avoid potential negative implications on your business processes. Thanks to the integration of SAP Enable Now in SAP S/4HANA Cloud, you can customize and enrich the Web Assistant – the context sensitive in-app end-user documentation. This allows you to customize any SAP in-app standard content and to create your own guided tours and context help for specific application functions. Furthermore, any SAP Enable output – such as interactive simulations, courses, documentation, or videos – can be embedded easily into the Web Assistant. Last but not least, I would like to mention SAP Activate where we have further refined the end-to-end experience for our SAP S/4HANA Cloud customers. 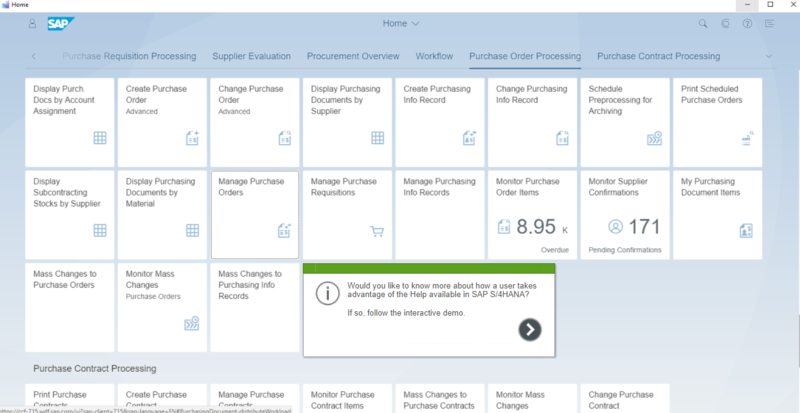 As of 1902, you can now work in the implementation portal within Cloud Application Lifecycle Management (CALM) for SAP S/4HANA Cloud. CALM makes use of our well-proven SAP Activate methodology and provides a smooth journey to Cloud ERP by providing you with guided to-do lists that contain all necessary implementation tasks, such as fit-to-standard analysis and scoping. Nice features from S/4HNA Cloud 1902 update.